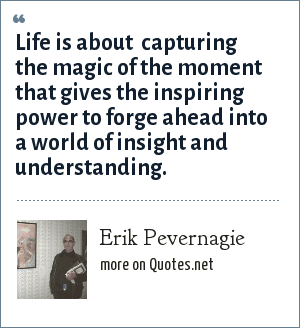 Erik Pevernagie: Life is about capturing the magic of the moment that gives the inspiring power to forge ahead into a world of insight and understanding. "Erik Pevernagie Quotes." Quotes.net. STANDS4 LLC, 2019. Web. 23 Apr. 2019. <https://www.quotes.net/quote/63807>.